“Much discussion took place regarding the materials to be used for the walls of the buildings. The stone at the corners (quoins), around the openings, cornices, copings, and other molded work, being all ‘cut’ was to be of Bedford, Indiana, lime stone. For the plain portions of the wall, there was a choice of locally made red brick and native stone, -- red granite preferably, if possible to procure it, under reasonable and satisfactory conditions. Stone from quarries near St. Louis, a good hard line stone, is an excellent building material, of lasting quality and strength, but does not appeal to one looking for color or variety of texture. Where these exist in this stone, they indicate upper ledges of the quarry, which are likely to be of a poor grade. Missouri red granite has everything in the way of variety and color to recommend it, -- the questions it aroused, were, first, its cost, and second, could it be treated and built into a wall which would be less hard and unfeeling that its name, ‘granite’ implied. Both of these doubts were dispelled finally, but caused considerable uneasiness. The attractive effect of the introduction of golden or salmon yellowish granite, did not last as these became quit black upon exposure. The taste for ‘pressed brick’ of uniform color had so far passed out, that already efforts were being made by manufacturers to furnish ‘sand mould’ bricks or ‘wire cut’ bricks, varying a little in color and texture to provide less mechanical looking and more attractive walls. May 2015 marks an important anniversary in the history of America's war in Viet Nam, and the counterculture protests that occurred across the United States, and especially on college campuses -- including the campus of Washington University in St. Louis. This image (below) of four students was taken at WU on May 5, 1970. The student on the upper left holds a sign that reads "4 students were killed yesterday" -- in reference to the shootings at Kent State, May 4, 1970. It was an event that pushed the already growing campus protests forward. The ROTC program buildings, Quonset-hut structures on the edge of Washington University's campus, were a focus of protest at WU in the late 1960s. And two days after the shootings and tragic deaths at Kent State on May 4, 1970 these ROTC buildings were set on fire in protest. Pictured below is the Air Force ROTC building, shortly before the fires. The Class of 1970 included this event in their end of year "Year Bag" providing a tongue-in-cheek 'build your own ROTC building' complete with matches (image below). In 2001 the student members of W.U.L.F (Washington University Liberation Front) reunited on campus, and lobbied President Clinton to pardon then student Howard Mechanic for throwing the firecracker deemed to have started this fire in 1970. 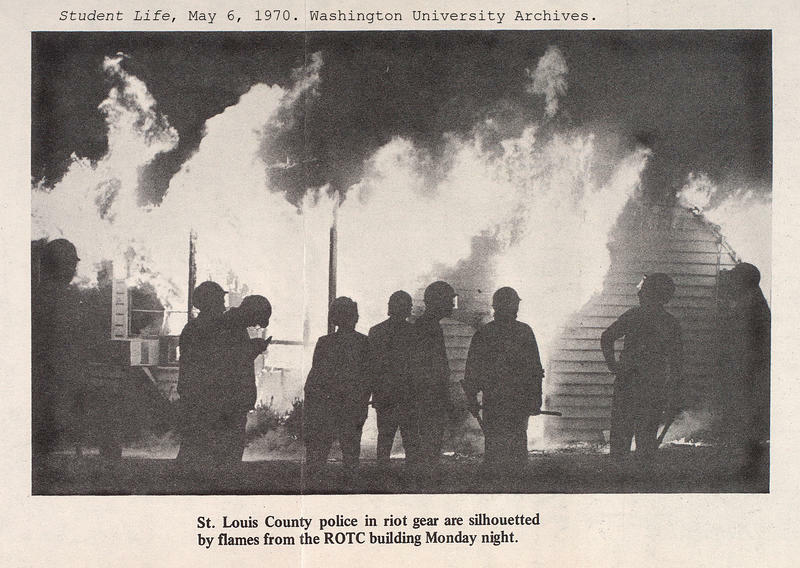 Following the burning, ROTC became a non-credit program and moved off campus. Only in 2014 did the program return to offering credit-based courses.